Even the most efficient warehouse operation can have an accident. And the accidents that happen aren’t always damaging to people, although, according to OSHA statistics, of the 68,400 powered industrial truck accidents reported annually, somewhere near two-thirds of these accidents do injure people. But it doesn’t have to be that way. There are many reasons why accidents like these occur, but one of the most prevalent reasons is the lack of space in the warehouse. It’s a fact of production and warehouse work: the cost of real estate is ever-growing, carving into the economical bottom line. But the cost following an accident, specifically the economic loss when production stalls, the worker’s compensation claims to be paid, and the facility repairs, are also costly. And while not every accident can be prevented with safety measures, some can. Here’s a few warehouse tips that might benefit the workflow/safety at your own operation. Tight aisle space is a problem. And most accidents occur at the end of aisles. So, place some type of visual aid, a visual and physical barrier. The barrier doesn’t need to be strong enough to prevent an accident (although angle iron barriers can be strong enough to take the brunt of some collisions), but the barrier should be something that keeps an operator aware of his or her surroundings. It’s not a cure-all of course, but it will help, especially if space in a warehouse is at a premium. A guard-railing is also one way to lessen the chance of accidents occurring to goods. And if you don’t have anything in place, then orange construction tape or tall construction cones may be enough to keep the machine operators in the warehouse or in the yard more aware of their surroundings. Anything that you can do to lessen the chance of damage to people or goods will benefit your business. 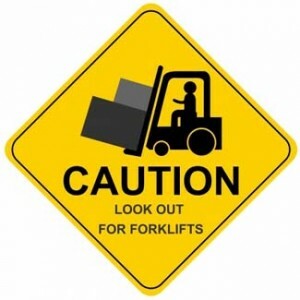 And if you have any questions or would like to purchase a new machine, something more compact or with more safety features, then call the experts at Anderson Forklift today.